On 2 Aug. 2013, the Celestron c14 robotic unit was remotely slewed to supernova SN 2013dy, in NGC 7250. 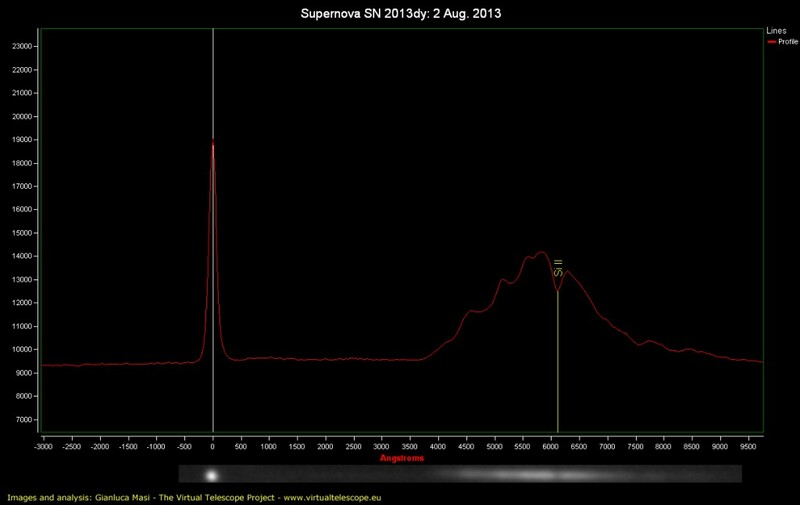 This is a type Ia supernova, so it was interesting to see if the typical spectroscopic features were visible. 7, 300-seconds unguided exposures were taken, using the 100 lines/mm diffraction grating available on the robotic telescope. Then, they were averaged and analyzed with RSpec. The resulting spectrum is plotted above and it shows the Si II absorbtion feature, showing its type Ia nature.